Peripherals connected to Single Board Computers (SBCs) require separatepower, sometimes in large amounts not typically available on the SBC. Additionally, some high power wireless radios require an additional power source, such as 5V for the RF power amplifier. Gateworks designed the GW16120 Mini-PCIePower and USB Expansion Card to meet these power needs while eliminating the need for an additional separate external power supply. Given the robust power supply on the Gateworks SBCs, using the power from the Mini-PCIe slot can provide many watts of power dependent on the SBC. Both 3.3V and 5V rails are provided along with an additional bonus USB port. The GW16120 also allows for stacking of a Mini-PCIe wireless radio or other card on a riser connector for applications that cannot give up a full Mini-PCIe slot. 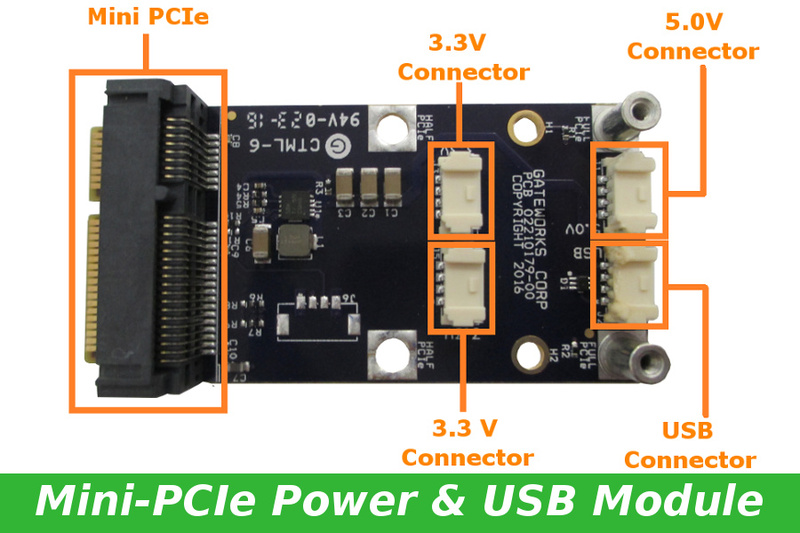 This entry was posted in Gateworks and tagged gateworks-2, mini-pcie-module, mini-pcie-usb, power-module by Gateworks. Bookmark the permalink.